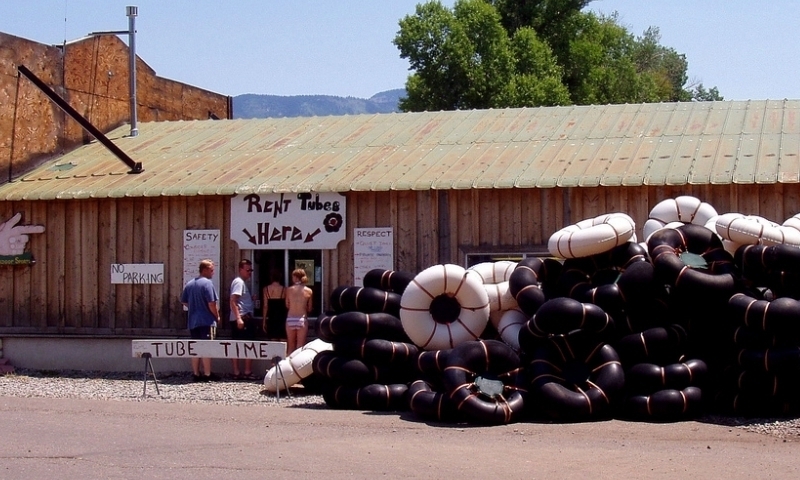 Summer days can get overwhelmingly hot, so gather some friends, rent an inner tube, then just kick off your shoes and dip your feet in the cool Yampa River for a relaxing float down the river. Tubing starts in June when the spring water levels drop and the temperatures rise. Various companies will rent tubes, provide detailed information and arrange shuttle service. Easy access in Steamboat makes for a convenient activity to relax and cool down. Take a trip to Craig for a quiet float without the crowds. For those who haven't tried tubing in a mountain river, it's a unique experience. The cold water, coming from upstream snowmelt, contrasts the hot summer sun, stronger than normal because of the altitude. Surrounded by friends and family, it's a relaxing way to spend an hour or two on the river. Some people like to go simply, with just a swimsuit and tube, while others tend to bring some comforts like a cooler for drinks, a floating frisbee for fun, and maybe some rope to tie all the tubes together. However, sunscreen and sturdy footwear are always recommended. Tubing generally starts in June, when the spring run-off has subsided a bit and the water temperature rises to a reasonable level. The season usually ends sometime in September, when the water level becomes too low to float. Steamboat has great tubing opportunity because the Yampa River runs straight through town, which means that tubing is a popular activity on a hot day. While the weekend crowds may not be the favorite attraction, there's a reason for the popularity. It's just that much fun! The most popular section is from the put-in at Fifth St. Bridge to the incredibly named James Brown Soul Center of the Universe Bridge, which is also known as Shield Drive, 3 miles northwest of town along US-40. This float takes about an hour, depending on water flow, and tube rental companies offer shuttles to and from the river access points. For the independent tubers with their own transportation, Fletcher Park is a popular put in spot, ending at the 13th Street Bridge or Howelsen Hill. Parking can be tricky because of time limits, so watch the signs to make sure your vehicles are legally allowed to stay long enough for your shuttle trip to return..
West of Steamboat Springs is the small town of Craig, where tubers can float the Yampa River without the crowds that can take over the river around Steamboat. The best put-in is near Loudy Simpson Park, south of the center of town. There are a number of river access points, so talk with some of the locals about the best place to plan for the pull-out. The most popular option is to pull-out at South Beach, three miles south of the Loudy Simpson Park access point. Tubing is generally a self-guided activity, so the only equipment necessary is an inner tube and transportation, both of which can be provided by the outdoor shops listed below.